Marijuana retailers often face huge hurdles when trying to attract customers due to strict regulations on advertising and marketing in many markets. 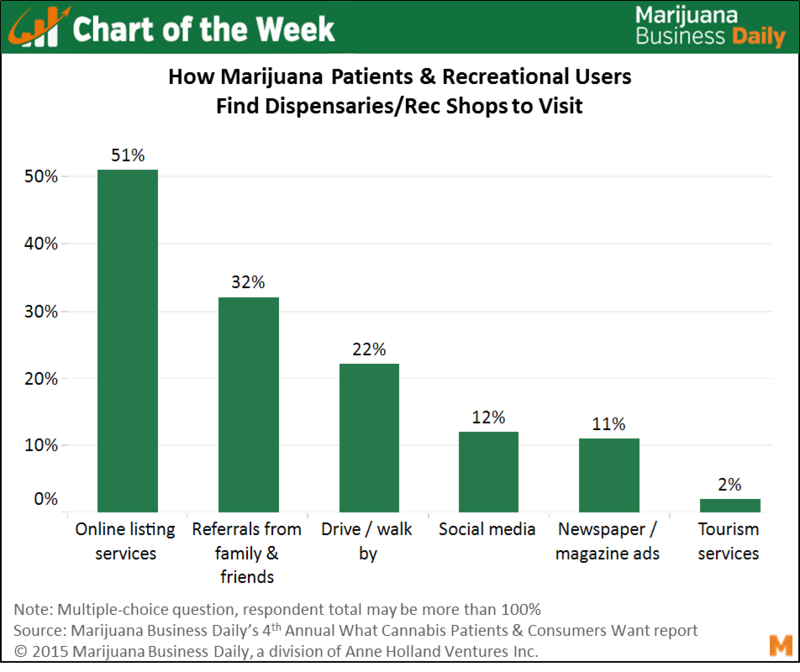 So how do patients and consumers find dispensaries and recreational shops to visit? Online listing services such as Weedmaps, Leafly and THC Finder are particularly popular, with 51% of patients and recreational consumers who buy legally in states with open dispensaries/rec stores saying they use these types of sites, according to data in the 2015 What Cannabis Patients & Consumers Want report. These services have become key tools for marijuana businesses to not only reach consumers, but to do so in a highly targeted manner. Leaving a positive impression on consumers during and after a visit is also critical in getting new customers: Nearly a third of users report relying on word of mouth to locate cannabis storefronts. Location and the look and feel of storefront’s exterior are also important, as over a fifth of consumers are simply stopping at outlets they notice while driving or walking by. And in a sign that cannabis-centered tourism is gaining traction in recreational markets, 2% of users currently rely on companies that cater to visitors in search of marijuana. While that figure is small compared to other factors, it has risen from virtually no consumers relying on tourism services just a year prior. The percentage of users who seek out cannabis tourism services will likely continue to rise as recreational markets evolve and new ones – including Oregon and Alaska – come online. Medical cannabis tourism also will emerge in Nevada and Hawaii, which have elected to recognize out-of-state MMJ cards. Finally, while only about one in 10 medical and recreation consumers report relying on printed ads at least sometimes to find storefronts, that portion has surged by 8 percentage points compared to a year ago, proving these more traditional mediums are still very effective for marijuana businesses.